Walkways are an essential link between different sections and spaces in the garden and can be as simple or elaborate as you wish. The shape and materials you choose will make a big difference to the overall feel of your garden – whether a straight, formal path to a bench or focal point, or a leisurely, snaking route of exploration. Need more tips on garden design? Find out how to design a garden from scratch. Consider the textures and look of the garden, as well as the style of your home, to ensure the paths will complement the scene you are creating. Ensure materials blend well across the garden. Walkways should be attractive, but also practical and easily maintained additions to your outside space. Consider the natural access routes to gates, sheds, entertaining spaces, garden rooms, children’s play areas and other zones. These are where you need to place paths when designing your garden. You can also create pathways through existing plantings or meadows. Think about your path's usage, too – high-traffic areas will need to be wider and made of more durable surfaces. Consider the practical purpose of the path: do you need to get a wheelbarrow along it, or space for two people to walk side by side? Improve your garden's proportions: long, thin paths accentuate a narrow garden, while one that sweeps from side to side will give the illusion that the space is wider. Use repetition: doing so with plants or topiary lends definition and draws the eye laterally. Soften a garden with lots of straight lines: a simple bend in a path or an arrangement of containers can achieve this. You can also soften the lines of paths with spillover plants, or trimmed low hedging. On a budget? Loose materials, such as gravel or bark, are cheaper than brick and stone but will require regular attention and topping up. Costings for pavers can vary greatly depending on materials, from reconstituted to natural stone, clay pavers, concrete designs or different types of bricks. Shop around and you can find cheaper seconds. Create added interest by leaving some unpaved squares and plant with herbs such as thyme or camomile. Or, use a mix of different materials, being careful to keep the overall look cohesive – sticking to a limited colour palette of materials so nothing jars. Consider your property's period: decorative edging, such as ceramic tiles with rope topped patterns, is ideal for a garden that's part of a Victorian home. Draw the eye away from an unattractive area by creating a path in a good-looking material and lined with plenty of pretty planting. Use shallow steps as a gradual descent to bridge different levels. Where gardens, especially small ones, have a geometric layout and architecture, it is best to echo this with straight paths, framed with box hedging or repetitive forms. A wide, straight path leading to a feature such as a fountain directs the eye while giving the garden a sense of proportion and linear perspective. To widen the vista, place plants or containers along the length to draw the eye side to side. In a garden of rooms, pathways can be used to link the spaces, often through arches and tunnels. Natural stone and gravel are classic choices, but brick designs and mosaics can work well, too. Meandering paths, designed for you to enjoy the journey as much as the destination, immediately give a casual feel to a space. Natural-looking curves need enough space and repetition to feel right. Once you’ve set an arc or curve, keep the curves consistent in scale to lend a sense of uniformity to the effect. 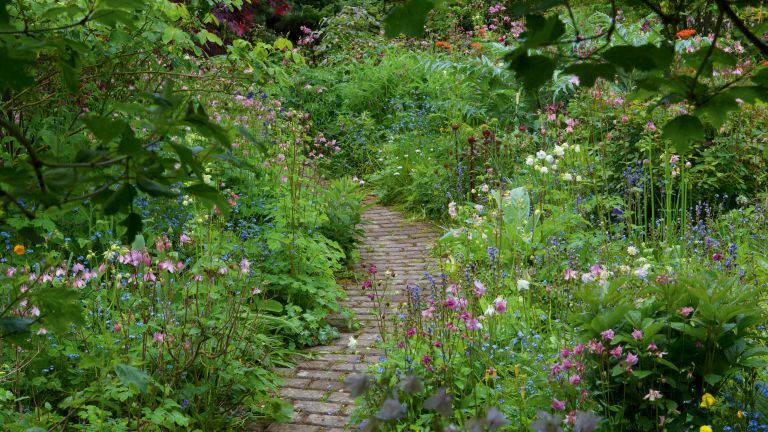 Winding your serpentine journey through dense planting works particularly well in a cottage garden. Use materials without a rigid geometry, such as gravel, reclaimed irregular bricks or stepping-stones. For woodlands, bark chips are a perfect choice. Allow plants to spills over the paths and ebb and flow with the seasons. Placing larger plants that protrude into the path will add a sense of depth and concealment along the way. Stepping stones are easy to lay; first test out the spacing for comfortable walking. They can be placed across a lawn, set in gravel or bark, or even in a garden bed for access. Dig the lawn or soil to allow for the thickness of the paver, plus a shallow depth of bedding sand. Make sure they are set perfectly in lawn so you can easily mow it. To increase the impression of length, decrease the size of the steps as you progress. Material options include from sawn timber or concrete slabs, to stone pavers and mosaic stepping-stones. Paving with stone or brick is the most common option for outdoor living areas and paths. Recycled bricks create lovely walkways with an instant aged and weathered look. Paving designs can be simple, as neutral foils to the planting, or dynamic with interlocking patterns. The design can vary along the path or be edged with a contrasting material; however, too much pattern can look busy and reduce the appearance of size, while linear designs will draw you along to the end point and pointing bricks in the same direction creates momentum. Consider the colour and texture of the different paving materials. For a unified look select options that match walls and patio areas. Find out more about picking the best paving for your garden – and how to lay a herringbone path. Mown paths in large areas of grass or meadow are the simplest solution. Wide lawn paths between mirror-image herbaceous borders are a classic choice for strolling and unify other areas of lawn. Place a bench, arbour or large urn at the end of the promenade as a destination point. Find out how to grow a luscious wildlife garden to complement a grass path. Bark chips, crushed decorative aggregates, shingle and stone gravel paths don’t need defined edges so you can let nature take its course with encroaching plants. Practical and porous, they are cheaper and easier to lay than hard surfaces and more durable than grass or groundcover. Pebbles and gravel can be laid loose, so are ideal for small areas where paving would be difficult or impractical. To avoid gravel sinking into the ground, lay weed matting landscape fabric, cover with sand and water, compact down and cover with gravel. Many plants will grow happily among the gravel for pretty effect. If you need to contain the path where it abuts the borders, edge in brick, timber, or try reclaimed materials, such as half-buried, upended glass bottles. Find out how to choose the best gravel for your garden – and how to lay a gravel path from scratch. Remove leaves, moss and algae where they could become hazardous when wet. Regularly scrub stone paving located under trees or in shade, to avoid it becoming slippery. Weed pathways regularly and remove self-seeding plants where you don't want them. Make sure access paths to the house are adequately and appropriately lit. Keep regularly used walkways clear of overhanging or sharp plants. Always use permeable paving materials to help prevent localised flooding.